FIRST PITH OF 2019........LET'S SEE WHAT YOU GOT! 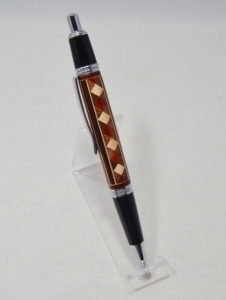 This is the pen I sent to my partner, penmaker1967. His camera isn’t working so he asked me to post the pic. 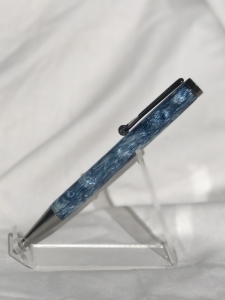 It is an Indigo kit paired with a Diamondcast blank. I received a very cool pen from my PITH partner Darin (aka Fordwakeman) today. He named it “Smith and Wesson beats 4 of a kind”, it uses two 500 S&W shell casing that are powder coated. Very cool, very different then what I make or have ever made. The fit and finish is superb, very well made. I’m sure it will get lots so comments at work. He mentioned the twist mechanism is from a Gatsby pen. He also threw in some blanks, very nice! Can’t wait to make a pen with the redwood, interesting grain. Thanks for organizing this PITH, it is my first one, what a great experience! That is a cool pen. Every time I look at this website, I am amazed with the pens I see. This is thing outside the box and it’s cool! Just received this from my PITH partner Seer, in the mail today. 3d printed blank. Also a bunch of blanks. I received this very nice pen and blanks from Mark James. The segmenting is amazing and most of the blanks I have never turned those woods. Thanks Mark for your generosity ! All I can say is WOW! I received my first fountain pen from Tim (AKA TG Design). A note on the pen from Tim. 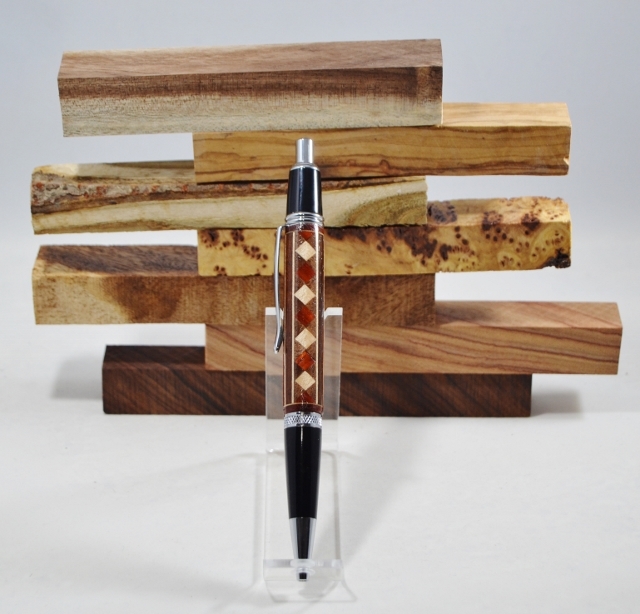 "The wood is desert ironwood, it’s the first time I made a pen with it. I used a jig I designed and made to put the five sided twist on it after I turn the diameters down. The cap was fun because it has a tapper in it. I think the pen kit in gold really pops. Hope you like it, I know foundation pens can be fussy, but it’s a nice change." This pictures don't do this pen justice. The fit and finish are superb. Tim sent some ash and madrone burl pen blanks as part of the Deal. 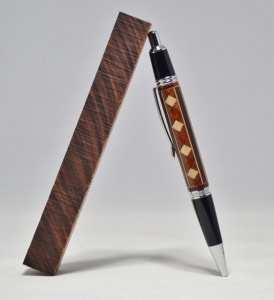 This is an incredibly sneaky pen. You really need to read the description and then look carefully at the pictures. Very,very nice - not an everyday turning. Well done. Darin and Mark, thanks for the kind words. It was a fun pen to make. Looking forward to the next PITH.